Yesterday the BBC broadcast “Climate Change – The Facts”. Jaime Jessop has already posted the first of a promised number of critical commentaries. Alex Cull has already started a transcript. Another here. What we’re doing right now is we’re so rapidly changing the climate, for the first time in the world’s history people can see the impact of climate change. Greater storms, greater floods, greater heatwaves, extreme sea-level rise. This observation is since 1948. This is partly because land has warmed faster than the oceans and partly because the greatest warming is in the Arctic. See two graphics I produced last year from the HADCRUT4 data. Note that much of the Canada-US border is at 49N, though Toronto is at 44N. Canada is land based and much of its area is in the in the Arctic. Being part of a continental land mass, Canada also has extremely cold winters and fairly hot summers. But overall it is cold. Average Canadian temperatures from Berkeley Earth in 2013 were still -3.5C, up from -5.5C in 1900. BE graphic reproduced below. 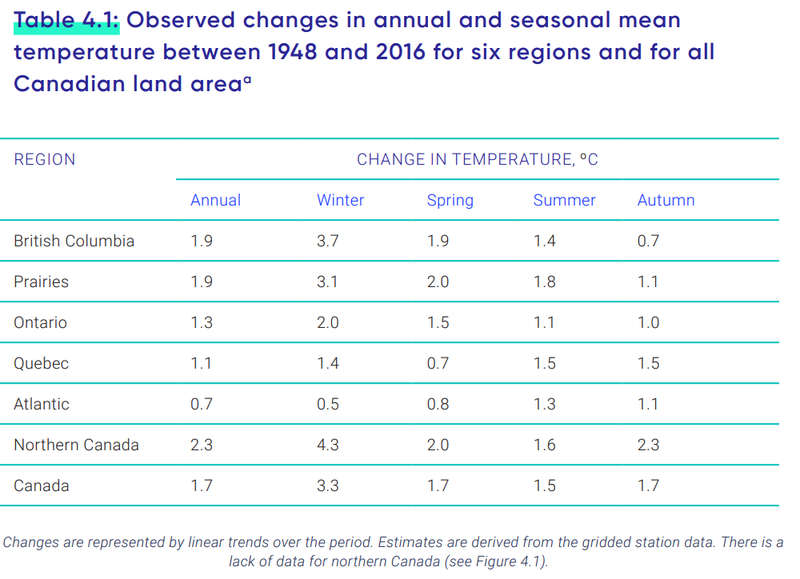 In Canada as a whole, and in four of the six areas, Winter average temperatures have warmed faster than those in the Summer. The other two have coastal influences, where I would expect the difference between summer and winter to be less extreme than Canada as a whole. Climate has generally become less extreme. However, if climate is becoming more extreme as a result of general warming then it this would result in more warm temperature records than cold temperature records to be set in recent decades. From Wikipedia has Lists of extreme temperatures in Canada. Of the 13 Provinces and Territories, only two have heat records more recent than 1950. That is Nunavut in 1989 and Yukon in 2004. For extreme cold, records are more spread out, with the two most recent in 1972 & 1973. Wikipedia also has lists of highest & lowest temperatures ever recorded in Canada as a whole. The hottest has duplicates in terms of adjacent places, or the same places on adjacent days. Not surprisingly nearly all are located well inland and close to the US border. The record highest is 45.0 °C on July 5, 1937. The bottom half of the list is of records of 43.3 °C or 110 °F. The three most recent were set in 1949, 1960 and 1961. The coldest ever recorded in Canada was -63.0 °C on February 3, 1947 at Snag Yukon. The third lowest was −59.4 °C in 1975. On the list are three from this century. −49.8 °C on January 11, 2018, −48.6 °C on December 30, 2017 and −42 °C on December 17, 2013. Eleven of the thirteen provinces and territories are represented in the 31 records on the coldest list, and there is 21.9 °C difference between the top and bottom of the list. Seventy years of Winter warming in Canada have raised average temperatures by 3.3 °C, but the extreme low temperatures are 13 °C higher. It would seem that the biggest news is of winter warming of 3.3 °C in 70 years has resulted in far less extreme cold, and considerably lower extreme cold temperatures. The more moderate summer warming has not resulted in record heatwaves. The evidence is that Canada’s warming has made temperatures less extreme, contradicting the consensus claims that warming leads to more extremes. In Canada, global warming appears to be causing climate changing for the better. So why is the Canadian Government trying to stop it? As of noon today it has reached 4.18 million signatures, up from 3 million yesterday morning and just a million two days ago. Guido Fawkes noted that there are a number of foreign signatures, some likely to be fake. A massive EU Second Referendum petition in July 2016 had large numbers of fake signatures created by bots, including large numbers from the Vatican and Antarctica, with at least 77,000 being removed. This might be happening with the current petition. This could be by bots, or by individuals making multiple signatures through using multiple email addresses. 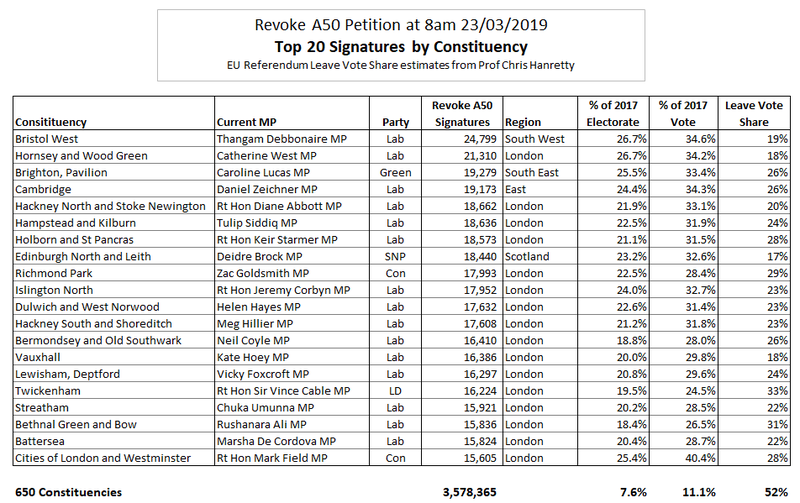 I have downloaded the data at around 8am this morning, when there were 3.78 listed signatures, of which 3.64 million were against the 650 UK constituencies. I ran the 8am signatures by constituency against data from the General Election 2017, including for the sitting MP, the Political Party in 2017, the electorate and the valid votes cast. I have also used estimated Leave Vote figures by constituency from Politics Professor Chris Hanretty. Although they are estimates, I do believe it is very unlikely that they are more than a few percentage out. An estimated extreme Remain constituency would have been unlikely to have voted Leave. 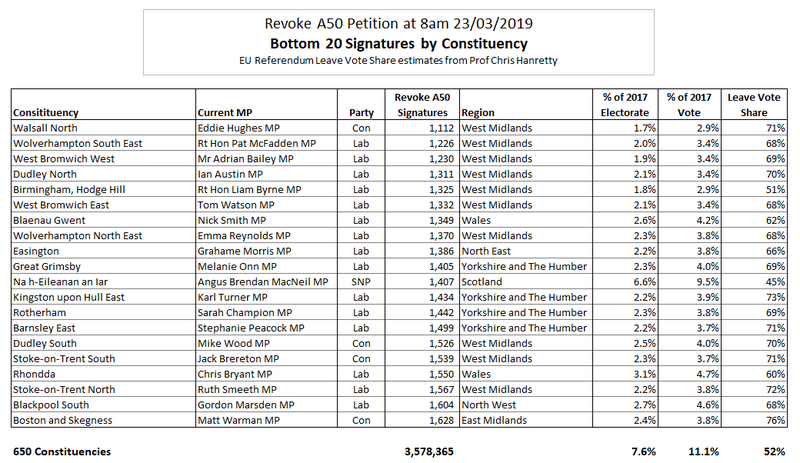 The Constituencies with the top 20 signatures are as follows. Note that most of consituencies are Labour-held and in London. The constituencies of three key members of the Shadow Cabinet are included. Islington South and Finsbury (Rt Hon Emily Thornberry MP) is number 21 on the list. Chuka Umunna MP has left the Labour Party. But alongside Caroline Lucas MP and Rt Hon Vince Cable MP, is a non-Labour MP with an extreme pro-Remain stance. All constituencies voted very strongly to Remain in the EU. I suspect that there is some multiple voting going on. In every single constituency the signatures on an online petition are over a quarter of the number of valid votes in the 2017 General Election. Cities of London & Westminster Constituency exceeds 40%. This is the prime target if you want to send a scam message to the occupants of the Palace of Westminster. 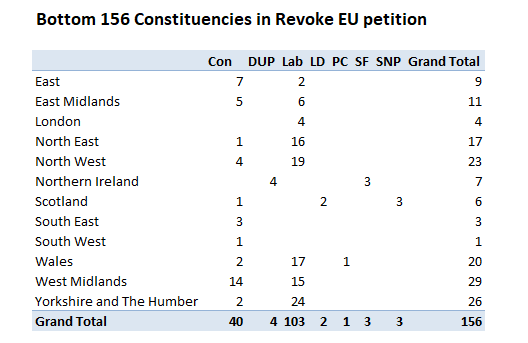 At the opposite end of the spectrum are the bottom 20 constituencies for signatures. None of the constituencies are in London or South of England. Note that 15 of the constituencies have Labour MPs and are located in the traditional Labour heartlands of the North of England, the Midlands and Wales. Na h-Eileanan an Iar is an exception in that it voted remain. But it is also by far the smallest constituency, so is an anomaly. On average there was a 67% Leave vote. The dominance of the top 20 metropolitan constituencies had 358,560 signatures at 8am, or 10% of the UK total, compared to 355,526 of the bottom 156 constituencies. Yet in terms of a voice these top 3% of constituencies get represented in the media far more than the bottom 24%. That is a major reason a majority voted to Leave the EU. In many areas people were sick of being controlled by outsiders who have different perspectives, and will not listen to them. The EU Referendum was a big up-yours to the London-based Metropolitans. Finally, here is a little pivot table of the bottom 156 constituencies by Region and by Party of the MP. The constituencies represented are just 24% of the total, but around half those in the forgotten regions of Wales, North East, West Midlands and Yorkshire & Humber. I have already posted twice on coral reefs, but skirted round the article on Coral Alarmism by Geoff Price at his own blog on April 2nd 2018, reposted at ATTP eleven months later. By reposting this article Prof Ken Rice has shown how derisory is the evidence for global warming being the cause of increasing coral bleaching. Checking the sources that Price gives for (a) evidence of global warming (b) media sources of coral bleaching reveal there is no unambiguous underlying evidence to make a persuasive case linking of one with the other. Further. the major peer review paper that Price cites finds that changes in severe coral bleaching events are not explained by global warming. The first issue I want to deal with is the evidence that Price presents for the increase in coral bleaching being due to global warming. In our window of time here and on our watch, we’re observing the unfolding collapse of global coral reef cover – the largest living structures on the planet, relatively priceless in terms of human and economic value, and stunningly beautiful – due to human-induced stresses, now most prominently from human-caused global anthropogenic (greenhouse) warming of the oceans. 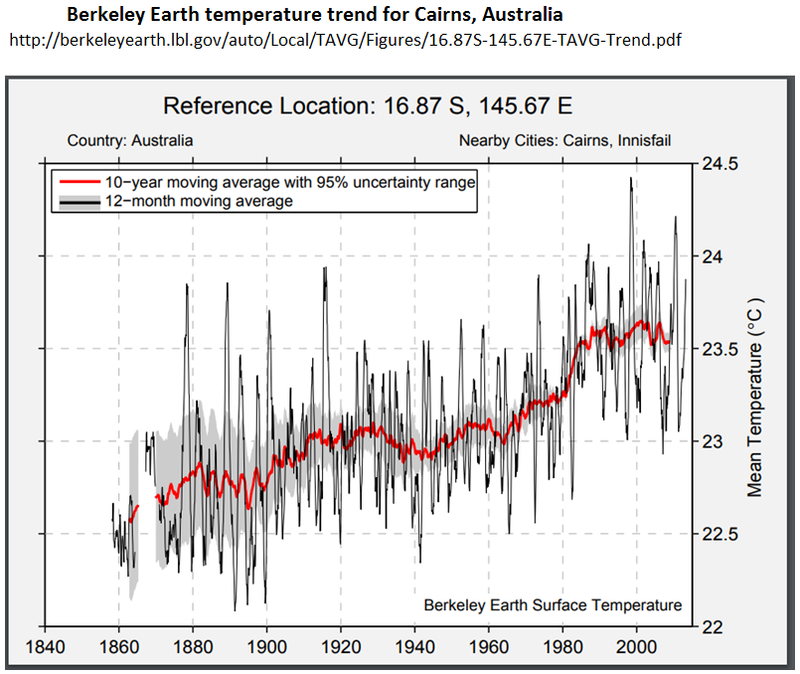 The claim of human induced warming is not backed up by any evidence. That global average temperatures have been rising for well over a century does not mean that this was human-induced. It could be natural or just some random cyclical cycle in a chaotic complex system, or some combination of all three. The evidence of warming oceans is the NOAA data of estimated increase in ocean heat content from 1960. There are a number of things wrong with this approach. The data period is only from 1960; heat stress in corals is from the amount of temperature rise; and the data is for 0-700m down, whilst most corals reside just a few meters below the surface. A much better measure is the sea surface temperature data records, which measures temperature just below the surface. Below is the HADCRUT4 land and ocean anomalies temperature anomalies that I charted last year. Crucially, the HADSST3 ocean warming data shows a similar global average temperature increase in the early twentieth century as the post 1975 warming. Both were about 0.5C, a value likely much less than the seasonal sea surface temperature change. Also, the rise in GHG gases – especially of CO2 – is much more post 1950 than from 1800 to 1940. The data does not support the idea that all warming is human-caused, unless global warming is caused by Mother Gaia anticipating the rise in CO2 levels. Even then, then rise in global sea surface temperatures is not an indication of warming in a particular area. The Great Barrier Reef, for instance has shown little or no warming since 1980. From my previous post, observed major bleaching events do not correspond to any rise in warming, or any increase in extreme temperatures. Some articles in major media break through, e.g. Global Warming’s Toll on Coral Reefs: As if They’re ‘Ravaged by War’, though the impact on public awareness and policy action remains low. The impact is global including the Great Barrier Reef (GBR), Japan, the South Pacific, Hawaii, the Florida keys, and Belize. The “Ravaged by War” article in the New York Times of Jan 4 2018. At the start of the article is stated “large-scale coral bleaching events……were virtually unheard-of before the 1980s“, whereas later on is stated ”before 1982-3, mass bleaching events across wide areas were nonexistent.” The perceived lack of bleaching before the 1980s is changed into a fact. The lack of perception is due to lack of wide-scale research. But even 1982-3 as the first year of reporting of mass bleaching is contradicted by Figure 1c in Glynn 1993, reference 3 in the Hughes et al 2018 paper that prompted the NYT article. 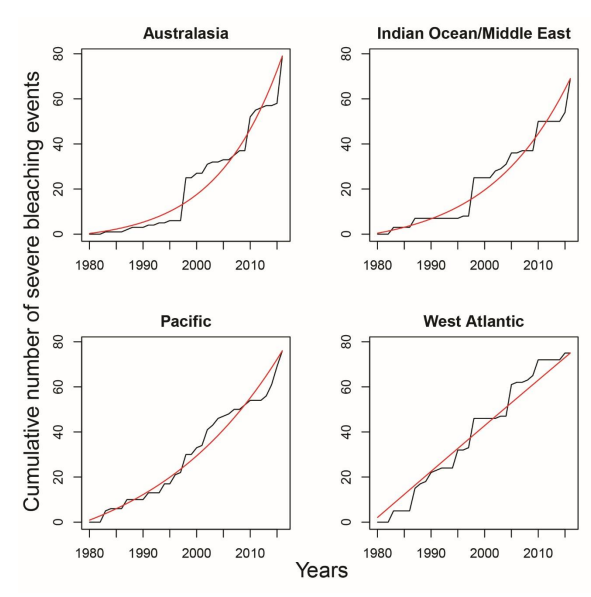 1978 and 1979 have far more recorded mass coral mortalities than 1982 and 1993. The link is to a page of high quality pictures of coral bleaching from around the world. The rise of digital photography, and the increase in the numbers of people diving reefs with cameras in the last twenty years is evidence observation bias not of real increase. In the past, lack of wide-scale human perception does not mean the issue was not there. From the UK Independent April 20 2016 is the headline “Great Barrier Reef: Half of natural wonder is ‘dead or dying’ and it is on the brink of extinction, scientists say“. The event is partly being caused by the strong El Nino weather system that has swept across the world in the last year. But global warming is the underlying cause, say scientists, and so the bleaching and death is likely to continue. The claim that global warming is the underlying cause of the bleaching is not attributed to any one person, or group. Prof Terry Hughes only makes a statement about the current state of affairs not being observed before, not that, in reality, it is unprecedented. Again a difference between perceptions and underlying reality. Experts have, for quite a while now, believed that corals are among the most susceptible organisms to climate change. In fact, the world has already lost 30-40 per cent of its total documented coral cover. According to the ministry’s estimate, 70 per cent of the Sekisei lagoon in Okinawa had been killed due to bleaching, which occurs when unusually warm water forces coral to expel the algae living in their tissues. Unless water temperatures quickly return to normal, the coral eventually dies from lack of nutrition. Based on the survey done on 35 locations in Japan’s southernmost reaches from November to December 2016, the ministry observed that the plight of the reef has become “extremely serious” in recent years. According to a Japanese media, the dead coral has now turned dark brown and is now covered with algae. It also revealed that the average sea surface temperature between June and August 2016 in the southern part of the Okinawa island chain was 30.1°C—one to two degrees warmer than usual. According to the Japan meteorological agency, it was also the highest average temperature since records began in 1982. There is no link to the original source and from the statement the article is probably relying on media sources in English. Therefore there is no way of verifying whether the claims are due to warming. I would assume that the authors, like myself, do not speak Japanese, and the script is incomprehensible to them. Further, the article highlights just one of 35 locations in the Japanese study. This should be a signal that the cause of that extreme example of coral bleaching is more than just extreme temperatures. (C)orals in the (Sekisei) Lagoon have extensively diminished since park designation because of various reasons: terrestrial runoffs of red clay and wastewater; coral bleaching due to high water temperatures; and outbreaks of the predatory crown-of-thorns starfish (Acanthaster planci). Initial efforts have been made to reduce terrestrial runoffs to help the natural recovery of coral ecosystem health. Studies on coral distribution and techniques for reef rehabilitation are also in progress. It is does not look like global warming in the sole cause of the excessive coral bleaching in Sekisei Lagoon. It is also local human factors and a large predator. A little research of crown-of-thorns starfish reveals that sudden increases in populations are poorly understood and that it is also found on the Great Barrier Reef. Acanthaster planci has a number of predators, the lack of which might indicate reasons for the outbreaks. The South Pacific source is a blog post from March 2016 on American Samoan Reefs, a small part of the total extent of islands across the vast region. It is about coral bleaching being on hold, but there is an alert due to recent abnormally high temperatures. If bleaching did follow it would have been due to the El Nino event, which caused abnormally high average temperatures globally. The Florida Keys reference is a Washington Post article of June 25 2017 about how loss of the coral reefs through temperature rise will impact on tourism. It assumes that temperature rise is the sole course of coral reef loss. Finally the Belize article a New York Times opinion piece from July 6 2017, about a researcher visiting the coral reefs. There is no data provided for either local warming or trends in bleaching. Here we compiled de novo the history of recurrent bleaching from 1980 to 2016 for 100 globally distributed coral reef locations in 54 countries using a standardized protocol to examine patterns in the timing, recurrence, and intensity of bleaching episodes, including the latest global bleaching event from 2015 to 2016. Since 1980, 58% of severe bleaching events have been recorded during four strong El Niño periods (1982–1983, 1997–1998, 2009–2010, and 2015–2016) (Fig. 2A), with the remaining 42% occurring during hot summers in other ENSO phases. The median return time between pairs of severe bleaching events has diminished steadily since 1980 and is now only 6 years. The paper makes no direct claims about the increase in observed coral bleaching being related to global warming. But This is because the data does not show this. 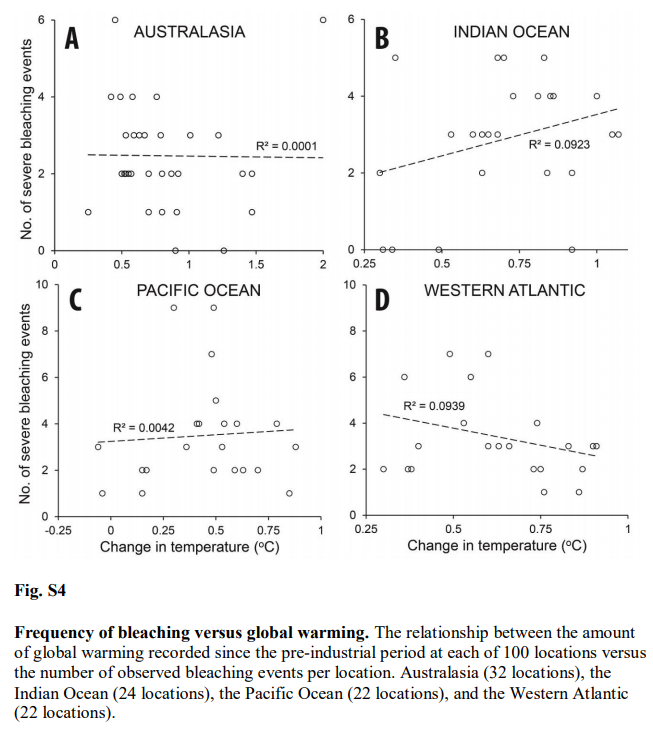 Supplementary data figure 4 tests the relationship between the number of severe coral bleaching events per location and warming at that location across four regions. For Australia R2 = 0.0001. That is zero. Better results can be achieved from two random unrelated data sets. The best relationship is for the West Atlantic – mostly the Caribbean. That is R2 = 0.0939. The downward slope implies a negative relationship. But still less than 10% of the variation in severe bleaching events is explained by rising temperatures. Figure 2A of the Supplementary materials I also find interesting in the context of Jaime Jessop’s contention that coral bleaching is related to El Ninos. Note that this is cumulative recorded severe bleaching events. The relative size of individual years is from the increase in that year. For Australasia, the three standout years are 1998, 2010 and 2016/2017. These are El Nino years, confirming Jaime’s hypothesus. For the West Atlantic there were also an unusual number of severe bleaching events in 1995 and 2005. No El Ninos there, but 2005 saw a record number of hurricanes in the area, and 1995 also saw an unusually high number including Hurricane Andrew, the last category 5 to make landfall in the USA. Although excess heat might be the principal cause of stress in coral reefs, I am sure they might also get stressed by severe storms, with the accompanying storm surges. If severe storms can lead to bleaching there is a problem with observation of bleaching. From Heron et al 2016 we learn that since the 1990s satellites have made twice-weekly recording of surface temperatures are 0.5 degree grids (about 50km), then comparing with the SST data to detect unusual runs of DHWs. Since 2015, a new product was launched with just 5km grids. It is then left to some intrepid scientists to go out in a boat, dive down and take samples. If severe storms do not have unusually high temperatures, then there will be no alerts of bleaching, so unless there are other attempts to observe, this will not be picked up, or could be picked up a short while later after an episode of unusual warming. Before the 1990s, there was no such over-all detection system, and likely much less researchers. Many of the bleaching events occurring before 1990 may not have been picked up, or if they were, there may have been less ability to define that events as major. By re-posting a dogmatic article ATTP has done a service to climate scepticism. Laying out a very bad, but well-referenced, case for global warming causing increased coral reef bleaching shows the inadequacies of that case. Where long periods of data collated on a consistent basis is used there is no correlation. Further, increasing observed frequency of bleaching events since is mostly due El Nino events being closer together, whilst the increase in observed bleaching can be accounted for by the greatly improved methods of detection and the resources put into observing, which are many times what they were a few decades ago. Geoff Price’s method of presenting the opinions of others, rather than focusing on the underlying data that supports the conjecture, is something in common with ATTP and others of the climate community. When checked, the fail to connect with any underlying reality. There is a rider to be made. The case for global warming is very poor by the traditional scientific methods of confronting conjectures with evidence of the natural world, and letting such evidence being the ultimate arbiter of that conjecture. From the consensus viewpoint popular today it is collective opinion that is the arbiter. The above is from the former point of view, which means from the latter view this is misinformation. Is increasing Great Barrier Reef coral bleaching related to climate change or observation bias? In the previous post I looked at whether the claimed increase in coral bleaching in the Great Barrier Reef was down to global average temperature rise. I concluded that this was not the case as the GBR has not warmed, or at least not warmed as much as the global temperatures. Here I look further at the data. (B)leaching via thermal stress is lab reproducible and uncontroversial. If you’re curious, see Jones et al 1998, “Temperature-induced bleaching of corals begins with impairment of the CO2 fixation mechanism in zooxanthellae”. The early effects of heat stress on the photosynthesis of symbiotic dinoflagellates (zooxanthellae) within the tissues of a reef‐building coral were examined using pulse‐amplitude‐modulated (PAM) chlorophyll fluorescence and photorespirometry. Exposure of Stylophora pistillata to 33 and 34 °C for 4 h resulted in ……….Quantum yield decreased to a greater extent on the illuminated surfaces of coral branches than on lower (shaded) surfaces, and also when high irradiance intensities were combined with elevated temperature (33 °C as opposed to 28 °C). ….. If I am reading this right. the coral was exposed to a temperature increase of 5-6 °C for a period of 4 hours. I can appreciate that the coral would suffer from this sudden change in temperature. Most waterborne creatures would be become distressed if the water temperature was increased rapidly. How much before it would seriously stress them might vary, but it is not a serious of tests I would like to carry out. But is there evidence of increasing heat stress causing increasing coral bleaching in the real world? That is, has there been both a rise in coral bleaching and a rise in these heat stress conditions? Clearly there will be seasonal changes in water temperature, even though in the tropics it might not be as large as, say, around the coast of the UK. Also, many over the corals migrate up and down the reef, so they could be tolerant of a range of temperatures. Whether worsening climate conditions have exacerbated heat stress conditions to such an extent that increased coral bleaching has occurred will only be confirmed by confronting the conjectures with the empirical data. I went looking for long-term data that coral bleaching is on the increase and came across and early example. 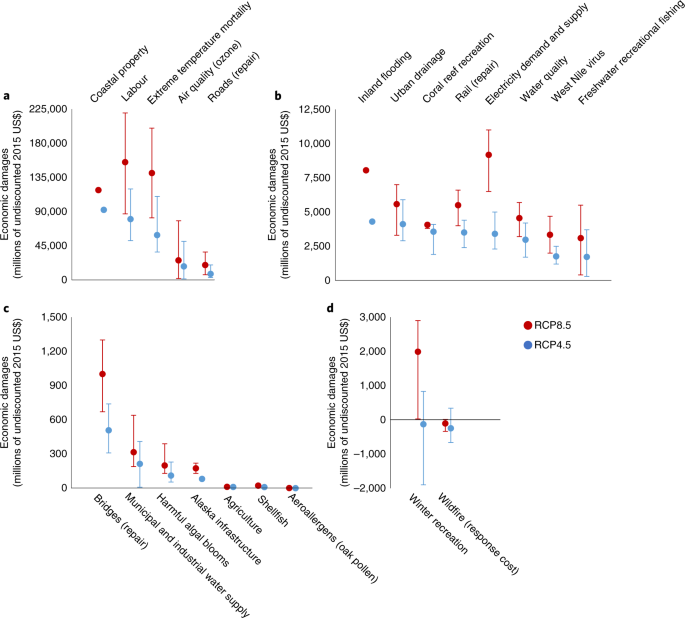 Mass coral mortalities in contemporary coral reef ecosystems have been reported in all major reef provinces since the 1870s (Stoddart 1969; Johannes 1975; Endean 1976; Pearson 1981; Brown 1987; Coffroth et al. 1990). Why, then, should the coral reef bleaching and mortality events of the 1980s command great concern? Probably, in large part, because the frequency and scale of bleaching disturbances are unprecedented in the scientific literature. But have coral bleaching events actually risen, or have the observations risen? That is in the past were there less observed bleaching events due to much less bleaching events or much less observations? Since the 1990s have observations of bleaching events increased further due to far more researchers leaving their families the safe climates of temperate countries to endure the perils of diving in waters warmer than a swimming pool? It is only by accurately estimating the observational impact that it is possible to estimate the real impact. The primary reason was the increase in the number of observations. Grantham mistook increasing recorded observations in a database with real world increases, than embellished the increase in the data to make that appear much more significant. The IPPR then lifted the false perception and the BBC’s Roger Harrabin copied the sentence into his report. The reality is that many extreme weather events occurred prior to the conscientious worldwide cataloguing of them from the 1980s. Just because disasters were not observed and reported to a centralized body did not mean they did not exist. With respect to catastrophic events in the underlying EM-DAT database it is possible to have some perspective on whether the frequency of reports of disasters are related to increase in actual disasters by looking at the number of deaths. Despite the number of reports going up, the total deaths have gone down. Compared to 1900-1949 in the current decade to mid-2018 “Climate” disaster deaths are down 84%, but reported “Climate” disasters are 65 times more frequent. I am curious to know how it is one might estimate the real quantity of reported instances of coral bleaching from this data. It would certainly be a lot less than the graph above shows. 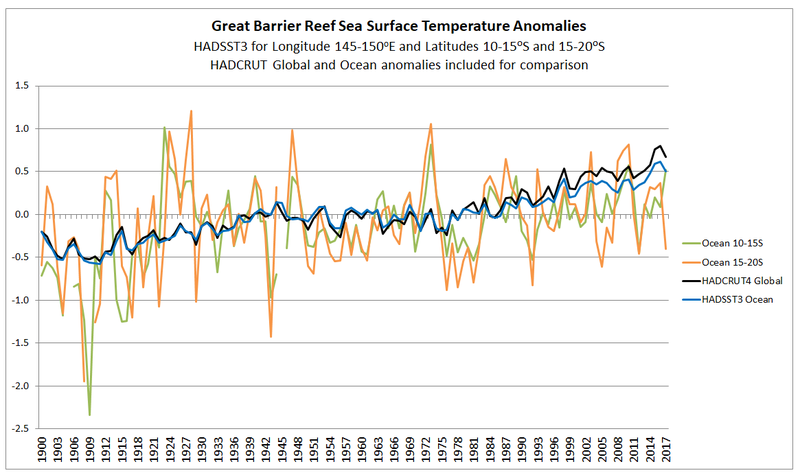 In the previous post I looked at temperature trends in the Great Barrier Reef. There are two main sources that suggest that, contrary to the world as a whole, GBR average temperatures have not increased, or increased much less than the global average. 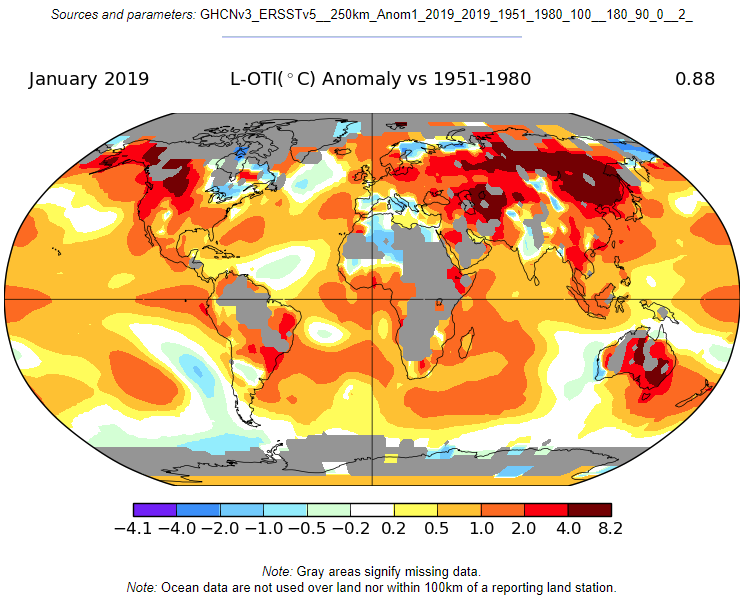 This was shown on the NASA Giss map comparing Jan-2019 with the 1951-1980 average and for two HADSST3 ocean data 5ox5o gridcells. For the latter I only charted the temperature anomaly for two gridcells which are at the North and middle of the GBR. I have updated this chart to include the gridcell 150-155oE / 20-25oS at the southern end of the GBR. There is an increase in warming trend post 2000, influenced particularly by 2001 and 2003. This is not replicated further north. This is in agreement with the Gistemp map of temperature trends in the previous post, where the Southern end of the GBR showed moderate warming. 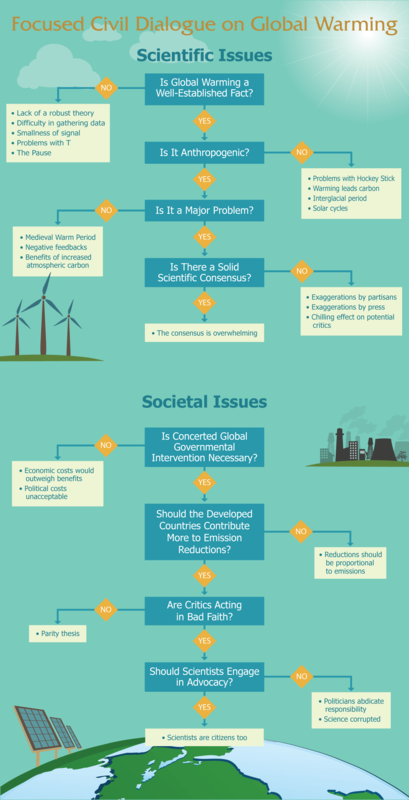 Has climate change still impacted on global warming? However, there is still an issue. If any real, but unknown, increase in coral bleaching has occurred it could still be due to sudden increases in surface sea temperatures, something more in accordance with the test in the lab. The distinctive geographic footprints of recurrent bleaching on the Great Barrier Reef in 1998, 2002 and 2016 were determined by the spatial pattern of sea temperatures in each year. So in 2002 the GBR had a localized mass bleaching episode, but did not share in the 2010 pan-tropical events of Rice’s quote. The spatial patterns, and the criteria used are explained. The severity and distinctive geographic footprints of bleaching in each of the three years can be explained by differences in the magnitude and spatial distribution of sea-surface temperature anomalies (Fig. 1a, b and Extended Data Table 1). In each year, 61-63% of reefs experienced four or more Degree Heating Weeks (DHW, oC-weeks). In 1998, heat stress was relatively constrained, ranging from 1-8 DHWs (Fig. 1c). In 2002, the distribution of DHW was broader, and 14% of reefs encountered 8-10 DHWs. In 2016, the spectrum of DHWs expanded further still, with 31% of reefs experiencing 8-16 DHWs (Fig. 1c). The largest heat stress occurred in the northern 1000 km-long section of the Great Barrier Reef. Consequently, the geographic pattern of severe bleaching in 2016 matched the strong north-south gradient in heat stress. In contrast, in 1998 and 2002, heat stress extremes and severe bleaching were both prominent further south (Fig. 1a, b). Degree Heating Week (DHW) The NOAA satellite-derived Degree Heating Week (DHW) is an experimental product designed to indicate the accumulated thermal stress that coral reefs experience. A DHW is equivalent to one week of sea surface temperature 1 deg C above the expected summertime maximum. That is, rather than the long-term temperature rise in global temperatures causing the alleged increase in coral bleaching, it is the human-caused global warming changing the climate by a more indirect means of making extreme heat events more frequent. This seems a bit of a tall stretch. However, the “Degree Heating Week” can be corroborated by the gridcell monthly HADSST3 ocean temperature data for the summer months if both the measures are data are accurate estimates of the underlying data. A paper published last December in Nature Climate Change (also with lead author Prof Terry Hughes) highlighted 1998, 2002, 2016 & 2017 as being major years of coral bleaching. Eco Watch has a short video of maps from the paper showing the locations of bleaching event locations, showing much more observed events in 2016 and 2017 than in 1998 and 2002. From the 2017 paper any extreme temperature anomalies should be most marked in 2016 across all areas of the GBR. 2002 should be less significant and predominantly in the south. 1998 should be a weaker version of 2002. Further, if summer extreme temperatures are the cause of heat stress in corals, then 1998, 2002, 2016 & 2017 should have warm summer months. For gridcells 145-150oE / 10-15oS and 150-155oE / 20-25oS respectively representing the northerly and summer extents of the Great Barrier Reef, I have extracted the January February and March anomalies since 1970, then circled the years 1998, 2002, 2016 and 2017. Shown the average of the three summer months. In the North of the GBR, 2016 and 2017 were unusually warm, whilst 2002 was a cool summer and 1998 was not unusual. This is consistent with the papers findings. But 2004 and 2010 were warm years without bleaching. In the South of the GBR 1998 was exceptionally warm in February. This might suggest an anomalous reading. 2002 was cooler than average and 2016 and 2017 about average. Also note, that in the North of the GBR summer temperatures appear to be a few tenths of a degree higher from the late 1990s than in the 1980s and early 1990s. In the South there appears to be no such increase. This is the reverse of what was found for the annual average temperatures and the reverse of where the most serious coral bleaching has occurred. On this basis the monthly summer temperature anomalies do not seem to correspond to the levels of coral bleaching. A further check is to look at the change in the anomaly from the previous month. If sea surface temperatures increase rapidly in summer, this may be the cause of heat stress as much as absolute magnitude above the long-term average. In the North of the GBR the February 1998 anomaly was almost a degree higher than the January anomaly. This is nothing exceptional in the record. 2002, 2016 & 2017 do not stand out at all. In the South of the GBR, the changes in anomaly from one month to the next are much greater than in the North of the GBR. February 1998 stands out. It could be due to problems in the data. 2002, 2016 and 2017 are unexceptional years. There also appears to be less volatility post 2000 contradicting any belief in climate getting more extreme. I believe it could be an indication that data quality has improved. Overall, the conjecture that global warming is resulting in increased coral bleaching in the Great Barrier Reeg directly through rising average temperatures, or indirectly through greater volatility in temperature data, is not supported by the HADSST3 surface temperature data from either the North or South of the reef. This does not necessarily mean that there is not a growing problem of heat stress, or though this seems the most likely conclusion. Alternative explanations could be that the sea surface temperature anomaly is inadequate or that other gridcells show something different. Which brings us back to the problem identified above. How much of the observed increase in coral bleaching is down to real increases in coral bleaching and how much is down to increased observations? In all areas of climate, there is a crucial difference between our perceptions based on limited data and the underlying reality. The average surface temperature of Earth has risen by close to 1°C as of the 1880s (1), and global temperatures in 2015 and 2016 were the warmest since instrumental record keeping began in the 19th century. The surface temperature consists of two parts, land and ocean data. HADCRUT4 data since 1850 is as follows. Recent land warming is significantly greater than ocean warming. Further, in the last 50 years the warming in the tropics was slightly less than the global average, with the greatest warming being north of the tropics. Below is a split of the HADCRUT4 data into eight bands of latitude that I compiled last year. NASA GISS have maps showing trends across the globe. The default is to compare the most recent month with the 1951-1980 average. The largest coral reef on the planet is the Great Barrier Reef off the North West Coast of Australia. From the map the warming is -0.2 to 0.2 °C. By implication, Hughes et al are claiming that coral bleaching in the Southern Hemisphere is being caused not by local average surface temperature rise but by a global average heavily influenced by land-based northern hemisphere temperature rise. However, this is only a modeled estimate of trends. Although local data trends for the sea is not readily available, Berkeley Earth does provide trends for towns on the coastline adjacent to the GBR. I have copied the trends for Cairns and Rockhampton, one located in the middle section of the GBR, the other at the Southern tip. 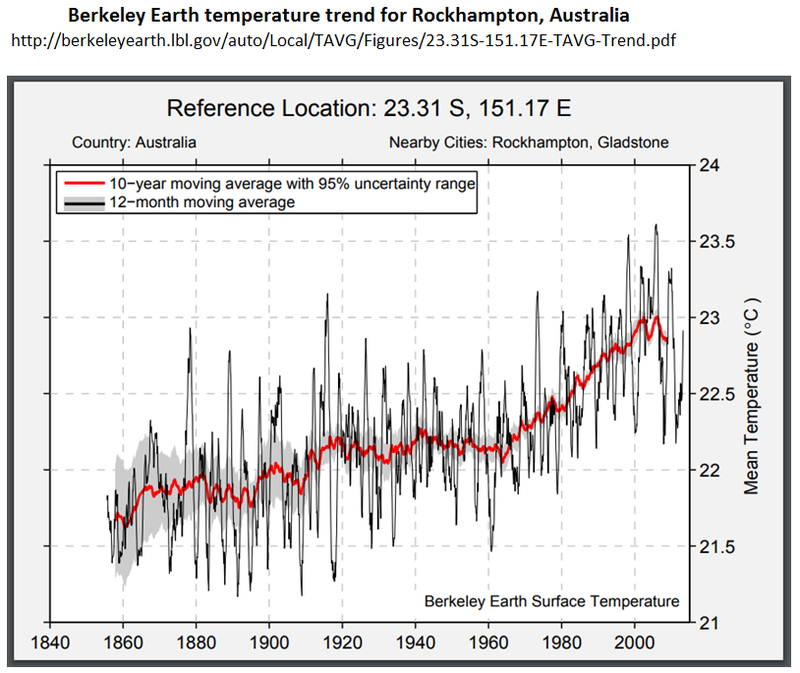 Cairns, in the middle of the GBR, has no warming since 1980, whilst Rockhampton has nearer the global average and no warming trend from 1998 to 2013. This is consistent with the NASA GISS map. BE are extremely thorough, providing the sites which make up the trend, with the distance from the location. The raw data reveals a more complex picture. For Townsville (one-third of the way from Cairns to Rockhampton) the station list is here. Looking at the list, many of the temperature data sets are of short duration, have poor quality data (e.g. Burdekin Shire Council 4875), or have breaks in the data (e.g. Ayr, Burdekin Shire Council 4876). Another issue with respect to the Great Barrier Reef is that many are inland, so might not be a good proxy for sea surface temperatures. However, there are a couple of stations that can be picked out with long records and near the coast. 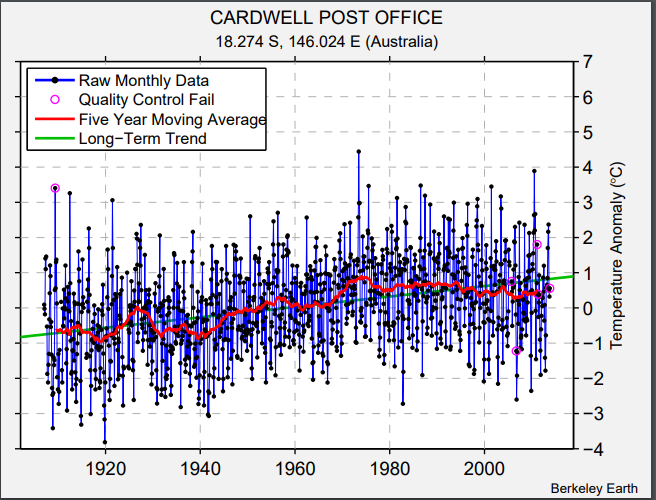 Cardwell Post Office 152368 had peak temperatures in the 1970s and cooling since. Relative to other stations, BE’s algorithms estimated there was a station bias of over 0.5°C in the 1970s. 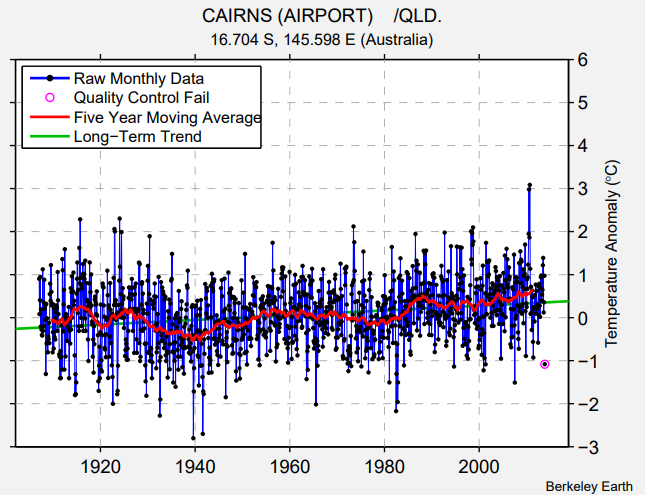 Cairns Airport 152392 (with data since 1908, twenty years before planes first flew from the site! ) has cooling in the 1930s and warming from 1940 to the late 1950s. The opposite of the global averages. There are no station bias adjustments until 1950, showing that this is typical of the regional expectation. Recent warming is confined to 1980s and a little post 2000. These results are confined to the land. I have found two sites on the GBR that have give a similar picture. Lihou Reef (17.117 S 152.002 E) and Marion Reef (19.090 S 152.386 E). Both for fairly short periods and the quality of the data is poor, which is not surprising considering the locations. But neither show any warming trend since the 1980’s whereas the faint grey line of the global land data does show a warming trend. The actual temperature data of the GBR indicates that not only are average temperatures not a cause of GBR bleaching, but that calculated global average temperature trends are not replicated on the North East Australian coast. With respect to the world’s largest coral reef, increase incoral bleaching is not empirically linked to any increase in average global temperatures. Following a comment by Paul Matthews, I have found the sea surface temperature data by location. The HADSST3 data is available in 5o by 5o gridcells. From data that I downloaded last year I have extracted the gridcells for 145-150oE/10-15oS and 145-150oE/15-20oS which cover most of the Great Barrier Reef, plus a large area besides. 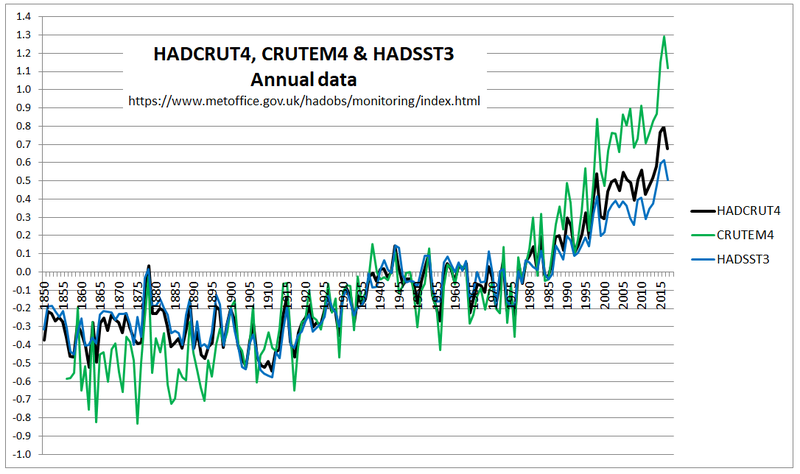 I have charted the annual averages alongside the HADCRUT4 global and HADSST3 ocean anomalies. Ocean surface temperatures for the Great Barrier Reef show no warming trend at all, whilst the global averages show a quite distinct warming trend. What is more important, if the coral bleaching is related to sudden increases in sea temperatures then it is the much more massive increases in local data that are important, not the global average. To test whether increases in temperatures are behind bleaching events requires looking for anomalous summer months in the data. Another post is required. After multiple comments at a blogpost by Jaime Jesssop in early January 2018 Geoff M Price wrote a post at his own blog “On Coal Alarmism” on 2nd April 2018. ATTP re-posted 11 months later on 5th March 2019. Personally I find the post, along with many of the comments, a pseudo-scientific and discriminatory attack piece. That may be the subject of another post.